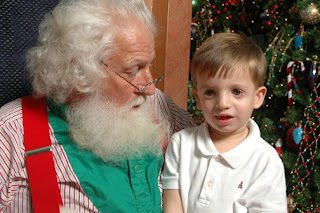 Jen Mirabile: Pics with Santa! 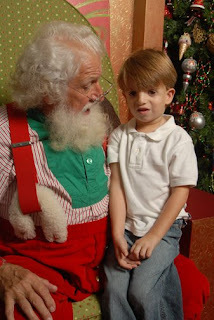 A couple friends of mine have posted pictures of their kids with Santa from the last few years and I loved it! 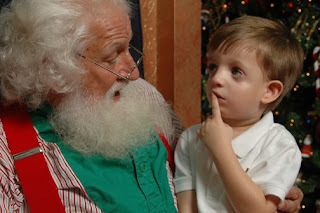 So I went looking for the pics of Andon and Santa. Trying to figure out which years I took him and actually have a picture to show! I did take him in 2004 but I didn't get the picture on a CD and I didn't bring a camera so I have a really cute picture that I can't post. It is the cutest one, you know when they are screaming their heads off to get away from the crazy man! I guess I didn't take him to see him in 2005 either because I can't find a picture and really can't remember taking him. Oh my, I can't believe I am talking about this! I know this is a big tradition with some people and you really wouldn't miss it but it hasn't really been to us. Though I will say it has been fun the last few years taking him! And here is the pic from this year... We took him over while Daddy was home for the week of Thanksgiving. I have to say, the Santa in Florida was awesome! 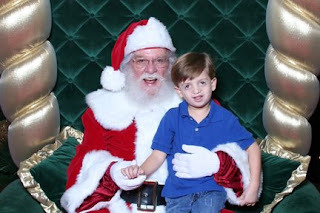 The Santa here was very sweet but the colors of the photos and the whole setup wasn't nearly as good. But oh well, Andon didn't notice a differance. It was so cute watching him talk to him so seriously about some Batman toy he wanted. And Santa was looking up at us saying "Oh a Batman toy, good". So funny! I don't really remember that from the years before so it was very funny to me. On a side note, I really can't stand not having a camera around. There are so many times I have gone to pull it out. I haven't heard back from Nikon yet as to when I will be getting it. Hopefully before Christmas!! I took Andon to his first Tae Kwon Do class today. They told us to come at 3:50 so we did and when we got there the guy said the class starts at 4:30. So he gave Andon a private lesson until the class began. We get 2 classes for free as well as the adorable uniform! And then we can decide if we want to enroll him. I think we will after Christmas vacation. It was so fun to watch him learning from a Tae Kwon Do master, I was just sitting in the back quietly watching and smiling. Jared had the last week off and we spent a lot of time together. Watching movies, eating way too much food and getting some Christmas shopping done. The only bummer thing was the day before Thanksgiving we decided to upgrade our software from Tiger to Leopard or something like that and cleared out our internet!? It was terrible! I'm not on the computer that much but to not be able to go on it AT ALL was no fun. And it was like that for 5 days! Anyway, I'm back in business and the computer is running better and faster than ever! I know the camera situation has got to be driving you crazy! It would me. It sounds like you guys had such a nice week. I love those relaxing times as a family. There is something very similar to the 2006 and 2007 Santa - whatup? We get pics with Santa every year too but I have no idea where they are! I hope Andon has fun in tae kwan do. My nephew did it for a while (he was shy so it helped him break out of that). And, he can officially speak more Korean than his half Korean mother...go figure! 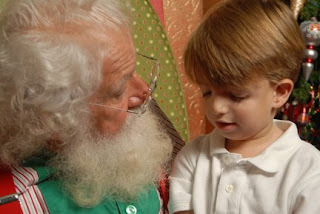 cute santa pics. I am feeling the camera pain now, too. my little camera wont turn on!!! No idea what's wrong (obviously its not a battery issue.. i know a little bit about cameras) I just have no idea what happened to it. Also, my big WONDERFUL camera... WON'T FOCUS PROPERLY!!! It only works right about half of the time! Jen, I am freaking out! 15! Jen, I love those pics! We love taking our girls each year. Yeah, we are one of "those" people. I'm glad I went early this year. We almost forgot one year and had to take them when we were out of town right before Christmas. I will never do that again! Love you and love those pics. . .we miss you! I wish you were here to do Christmas crafts, cookies and more with! The pics are great! I need to call you soon, I miss you! Our crazy family is gone and I finally got caught up on cleaning the downstairs today (the upstairs has a ways to go). Crazy having 9 people stay with you. :) Anyway I hope to see you this week!